Connie Chastain has announced that in her mind Confederate heritage has virtually nothing to do with Confederate history. Rather, as she now freely admits, for her it’s a process of picking and choosing what one wants to “honor”; it’s also imposing her present-day values and preferences on the historical record, wrenching evidence out of context to satisfy her inclinations. In other words, set aside historical correctness and political correctness, for now we have … Connie correctness. It’s a wonderful essay in which Connie, who has complained about lumping people together, does that once more … although, in a way, she has a point. All the people she lumps together are interested in historical accuracy. Connie freely admits that she could care less about that. She’ll just cherry-pick what she wants to remember and honor. She wants to honor service, period. She wants to honor sacrifice, period. And to her it doesn’t matter what leaders say … it matters to her why men fought (although, if she’s to be consistent, only when she approves of their motives … otherwise she’ll turn a blind eye to them). Think about applying that standard to certain other historical situations. In short, Connie wants to honor her ancestors in terms those very ancestors would not recognize … and in some cases might reject. She seeks in the past that which will support what she believes in today, a clear case of presentism. She has no respect for history or for the past in context. She has no interest in understanding her ancestors or history. Understand Confederate for who they were? Never, according to Connie correctness. Nor do I think they are suitable for some sort of ancestor worship, as heritage folks are sometimes accused of. I once read a statement by the League of the South that explained it well. “Our ancestors weren’t perfect and not everything they did was honorable.” I don’t know of any heritage advocates who would disagree. That doesn’t, and shouldn’t keep us from honoring the honorable things about them and their culture. Such as? Somehow these heritage folks never get around to answering that question. So what we have here is someone who freely admits to distorting the past in order to satisfy her beliefs and prejudices behind some ill-defined notion of “heritage” and “honor.” Given how she also distorts the views of others in her never-ending struggle to try to score debating points (ever see Connie engage in a sustained argument about historical issues? Of course not), this should come as no surprise. That must be why she finds fiction so attractive … she lives it. I must admit that I’ve never seen anyone make a public proclamation of their intellectual bankruptcy before. But the world continues to surprise me. At least now we know why she refused to debate Hunter Wallace: she’s basically conceding that he’s right about the history of white supremacy in the South as expressed by prominent southern leaders. If this is what passes for Confederate heritage, then we know why it’s in trouble … because it has nothing to do with the Confederacy and everything to do with one’s need to seek justification for their views and philosophy by misrepresenting history and selectively culling and twisting whatever can be used to validate one’s beliefs. Here’s a protest against lumping people together offered by a person who lumps people together. Ironically, the author’s also been lumped with me by Hunter Wallace, but she’s too skeered of confronting him. Indeed, she has yet to challenge any of his posts about southern and Confederate history as history. This may be because she doesn’t know any history: she admits she doesn’t care about it. That’s exactly the sort of thing you want to hear from someone who wants to restore southern pride and protect southern heritage: a confession of complete ignorance about what actually happened. And from that group … “The Jews already run just about everything. When you run the financial behemoth and the media, you don’t need much else.” Love Connie’s public! Waiting for someone to observe that Judah Benjamin was Jewish. Want an idea where some Flaggers come from? Try this. Methinks they forgot who won. 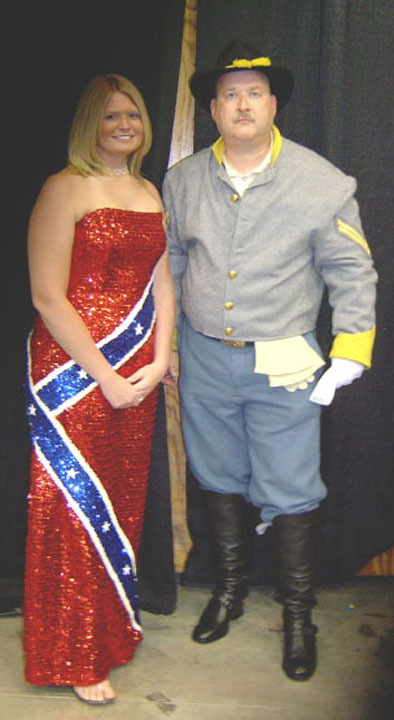 Then again, perhaps the Museum of the Confederacy went a little too far in the eyes of some. So, is this bad … … but this is okay? You tell me. UPDATE: Connie Chastain informs me that the image of the prom dress originally displayed here was “photoshopped,” and, upon examining the image, I found it offensive and exchanged it for the original. That Connie is currently blaming bloggers she targets for doing the photoshopping is a lie, of course, but then I attribute that to her continuing bitterness. Note that at first Connie had absolutely no problem with the offensive image, which portrayed a cartoon racist image of an African American. She wasn’t angry about that. You’ll have to ask her why that was okay with her.